The What: Ashly has released firmware and control app updates for its digiMIX24 24-channel digital mixer. The What Else: Ashly digiMIX24’s latest firmware update (v4.3) includes two significant improvements in functionality: AutoMix and Crossfade Mode. AutoMix gain sharing allows for applications where multiple microphones are active and used simultaneously. 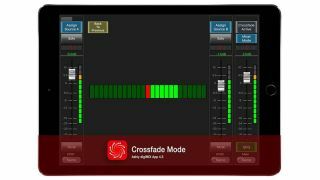 Crossfade Mode is a solution for engineers who require a live transition/crossfade operation between two selectable sources (mono or stereo mixer channels). Other notable improvements include improvements to Intelligent Meter Bridge. In addition to showing all fader positions, it now also shows Mute Status per channel. The Stereo Channel Link function has been greatly enhanced, providing more flexibility in routing and independent panning. In addition, Ashly digiMIX control app has been updated to version 4.3 to support all new features and is available for download at the iTunes app store. The Bottom Line: Ashly’s digiMIX24 is a 24-channel/14-bus digital mixer with a live control surface, comprehensive equalization and dynamics, 32-bit/48kHz fidelity, flexible inputs and outputs, and option cards for 32 channels of USB and Dante connectivity.